The N3000 Series H.264 compression engine delivers low-latency 1080p60 video at half the bandwidth of comparable encoders. High profile H.264 encoders output unicast or multicast to one or more N3000 Series decoders. Multiple selectable streaming protocols (RTP, RTSP, and more) allow for software endpoints during video to the desktop applications or third-party hardware endpoints like Roku, Amino, or Google TV. Adjustable bit-rates from 32-Kbps to 10-Mbps give the highest video fidelity at the lowest bandwidths on the market in keeping with SVSI's commitment to provide unsurpassed Networked AV quality. 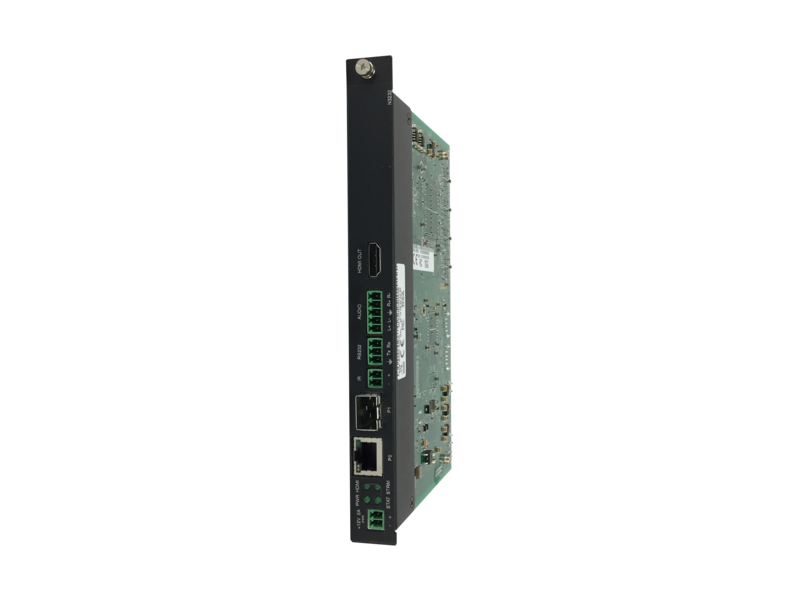 H.264 decoder Includes IR, serial, balanced audio, RJ45 and 1GB SFP (fiber or copper) network connections. Digital video output only. H.264 decoder card requires NMX-ACC-N9206 cage. The NMX-ENC-N3232 is the perfect solution for quality streaming over low bit rate WAN. Common applications include distance education, Multi-Site Enterprise, and IPTV Streaming.